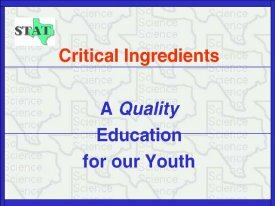 An absolute requirement for the future of science in the US is a quality education for our youth. This is particularly important in the primary, middle, and high school levels. The US has the best higher eductation systen in the world, but we are not producing the quality of entering students to fully take advantage of the abundant resources we now have in the Country.